So you’re shopping for an engagement ring? That’s exciting, and surely your soon-to-be fiancé will be excited too! Even if your significant other has given you a hint about the kind of ring they want, there’s still a lot to consider—like where to buy the diamond, for starters. One way to make the search easier: shop online. More people are buying high-quality diamonds from online sources like JamesAllen.com than ever before, and new technology now mimics—and often exceeds—the experience you’ll get in a store. Here’s what you need to know about buying diamonds online, plus a tip for scoring the best price. Do your research (which it seems like you’re doing, since you’re already reading this). Search websites and social media for consumer reviews—even Reddit oftentimes has unbiased reviews and ongoing conversations about diamond buying. You should be able to find this info fairly easily, and if you can’t, it’s a bad sign. You’ll want to look into how long the company has been in business and check that it belongs to a jewelry trade organization (more on that below). And don’t forget to check the company’s site for details about its shipping and return policies, resizing, secure payments, warranty, insurance appraisals and customer service. Reputable online jewelers like JamesAllen.com, Blue Nile and Brilliant Earth will be sure to outline all of this info. The jeweler should list its registrations with at least one of the major independent diamond associations like Gemological Institute of America (GIA), American Gem Society (AGS), or International Gemological Institute (IGI). These associations analyze and grade a diamond based on certain scales to ensure its value and quality. Each diamond is given a certificate that verifies the diamond’s specifications, including its color, carat weight, clarity and cut. You should never buy a diamond without a diamond certificate (this holds true online or in-store). When you buy a diamond online, knowing that it was objectively certified should give you peace of mind. While the diamond certification is crucial, it’s not enough. Diamonds with the exact same specs can look drastically different from each other, and therefore have a very different price tag. Unfortunately, you won’t be able to pick up on those differences and the rationale behind the cost if you are only relying on the certificate. The best way to see a diamond is up-close, and thanks to modern technology like the 360° Diamond Display Technology™ that JamesAllen.com uses, you can now do that online. The company photographs each of their 100,000+ conflict-free diamonds from every angle in HD quality and with up to 40 times greater magnification. This lets you get up close and personal as if you’re shopping in a store—without having to use a magnifying device. You can see every single detail of the diamond you’re considering—even how much it sparkles! People often say they want face-to-face interaction when choosing a diamond. But at most stores, you’re dealing with a salesperson whose primary motivation is quickly closing a deal. Since online customer service reps tend not to be commission-based, you’ll often find them more patient and helpful. JamesAllen.com’s website includes the first non-commissioned Real Time Diamond Consultation, a 24/7 on-demand service of diamond and jewelry experts who will answer any questions and help you view and compare individual diamonds to find the perfect match. An engagement ring is made up of two components—the diamond and the setting—but the diamond is typically the most expensive component of your purchase. That’s why saving 30 to 50 percent online—the discount you can expect from an online jeweler—is such a big win! Picking the metal and setting (aka the design of the ring) usually comes after you select your diamond. 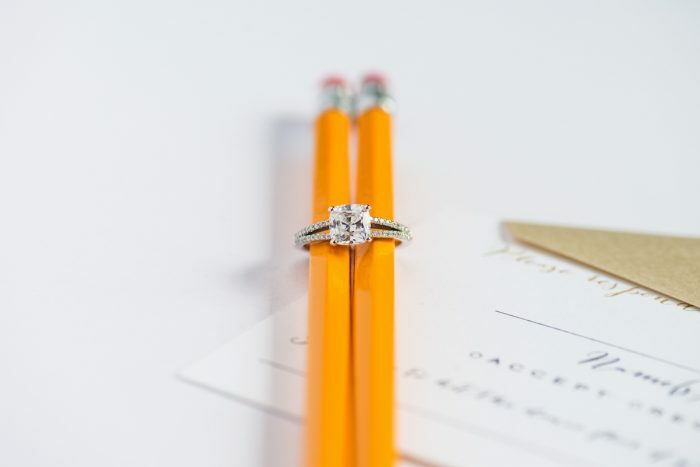 After you’ve found your diamond online, you can either design and customize it with the same retailer or bring it to a local jeweler. It’s totally up to you, though again, you may find the online process easier than you think. JamesAllen.com has more than 550 settings to choose from, and you can also browse other recently designed and purchased rings for inspiration. Of the four c’s—cut, clarity, carat, color—cut is the most impactful on a diamond’s appearance. Cut refers to a diamond’s proportions and determines how it reflects light and ultimately shines (which is the whole point, right?). The scale ranges from poor to excellent, and a diamond with a poor cut will look dull and less brilliant. Diamonds with ideal proportions might cost slightly more, but a shinier diamond will actually look larger (seriously). Instead of compromising on cut, consider going with an “under-sized” carat weight. That means it’s a bit less than the standard .5 or 1 or 2 carat weights. A diamond that’s .97 carats will look the same to the untrained eye as a 1 carat, especially if you go with an excellent cut. Rest assured, reputable online jewelry retailers understand just how big and meaningful this purchase is. The process on some sites is already amazing, and retailers are continuously working on ways to improve the experience, making it more hands-on, resource-rich and comfortable for their customers. If you’d like to learn more, our partner James Allen has a thorough FAQ section. We recommend giving it a read to answer any of your outstanding questions.